Another educational institution established during this period was the public library. As early as 1883, an association was formed in East Liverpool to establish a public library, but nothing ever came of it. Five years later, Will Thompson opened a public "reading room" stocked with newspapers and periodicals in a section of his music store. Through the efforts of the Trades and Labor Council of the city, a public library was established in 1896. Operating from a room in the Thompson building on Market Street near the Diamond, the library committee solicited donations from local business people to operate the facility. The library, opened in September of 1896, was staffed by Miss Ina Welch. Funds to support the library, however, were slow in coming and it was suggested that a tax levy be secured to support the facility. State law allowed the Board of Education to levy 3.5 mills for library purposes. As a result, temporary funding was achieved. In the meantime G.Y. Travis and M.E. Miskall took it upon themselves to write to Andrew Carnegie requesting him to donate a library to the city. Carnegie, who had lived at the home of William Morris, his uncle, in East Liverpool for two years prior to moving to Allegheny (Pittsburgh), Pennsylvania, took the request under advisement. In late July of 1899, Carnegie offered to donate fifty thousand dollars to construct a public library if the city would provide a site and three thousand dollars a year for maintenance and operations. When the Bradshaw property on the corner of Broadway and Fourth Street became available at public auction on 5 August, a group of twenty "energetic and public spirited citizens" led by S.J. Cripps purchased the site for $19,500 until the city could hold a special election and sell bonds to purchase the land. With the central school building directly across the street, the site was considered an excellent location for a public library. The bond issue authorizing an expenditure of twenty thousand dollars to repay the citizen's group was overwhelmingly approved by voters the following month. Unfortunately, as was the case with several other situations during this era, petty politics and jealousies soon clouded the enthusiasm. In November of 1899, city council selected John N. Taylor, F.D. Kitchel, W.L. Smith, George Peach, Jason Brookes, and George P. Ikirt as the city's library commission. The next day the city was in an uproar when it learned that G.Y. Travis, who was instrumental in securing the funds from Carnegie, and none of the twenty men who purchased the site were included on the commission. Council's action was denounced as "scandalous and outrageous." The owners of the Bradshaw site met to decide what they should do. Some members threatened to refuse to donate the site as a protest against council's decision and advocated dividing it into lots and selling them. Cooler heads prevailed and council was asked to reconsider its appointments. Within three days Kitchel resigned and Travis was appointed; however, it required three ballots to arrive at this decision and settle the controversy. The library commission then proceeded to solicit architect's drawings for the new building. It was rumored that a Youngstown architect would be the winner since he had an influential friend on the board. The commission decided not to open the bids and numbered the architectural plans in order to make its decision. Following several meetings, the plans of A. W. Scott of East Liverpool were selected by a vote of three to two. W.L. Smith and John N. Taylor voted for the runner-up's plan, which turned out to be those of the Youngstown architect. John N. Taylor immediately resigned from the library board and was replaced by Will Thompson. Although the controversies noted above caused unnecessary delays, by August of 1900 construction was underway. In April of 1902, the former public library and the soon to be activated new library were merged. The 2,500 volumes from the former library were transferred to the new building and added to the purchases made by the new library board. 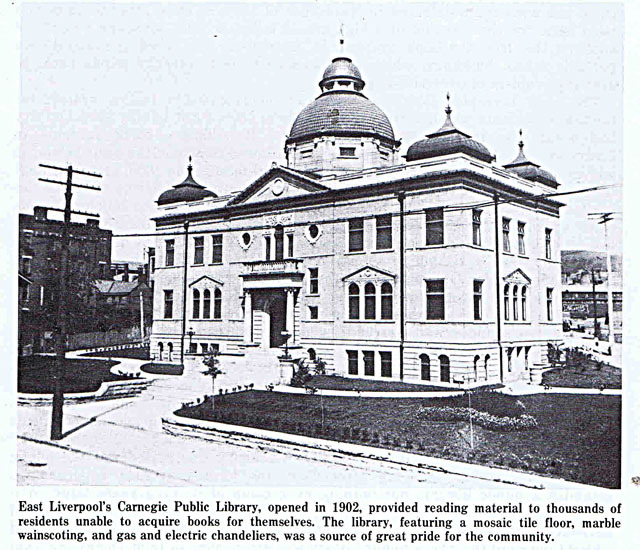 The new twenty-one room Carnegie Public Library was opened to the public on 8 May 1902 with great ceremony. Several months later, the Reverend W.E. Hill extolled the virtues of the library and its importance to the community. He said that East Liverpool was a community of working class people who were usually without the means to acquire books and that the availability of a comprehensive library was of great benefit to city residents. By 1905 librarian Gertrude Baker reported over 2,700 visitors per week and reported that circulation was brisk.